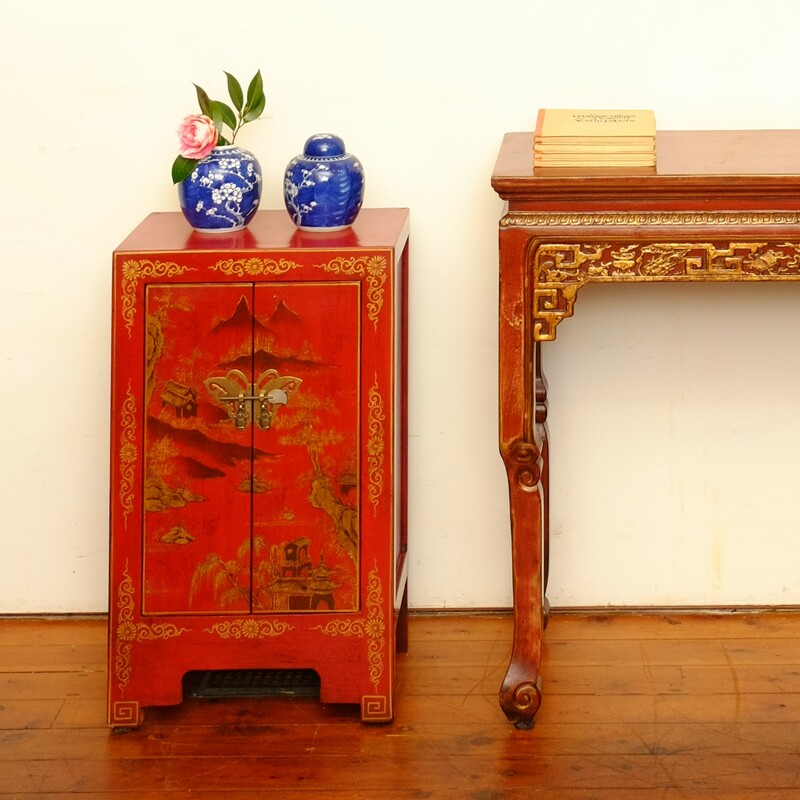 #15098 is a small red & yellow painted cabinet dating from the early 1900s. 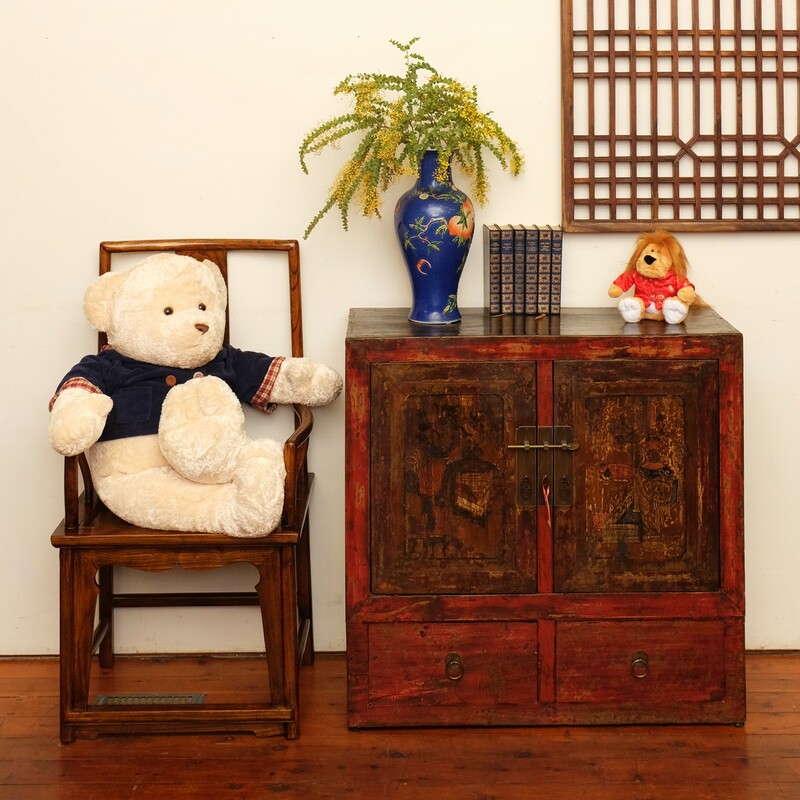 Made from northern elm in Ningxia, it has three drawers and two doors and measures 105 cm wide, 41cm deep and 85cm high. 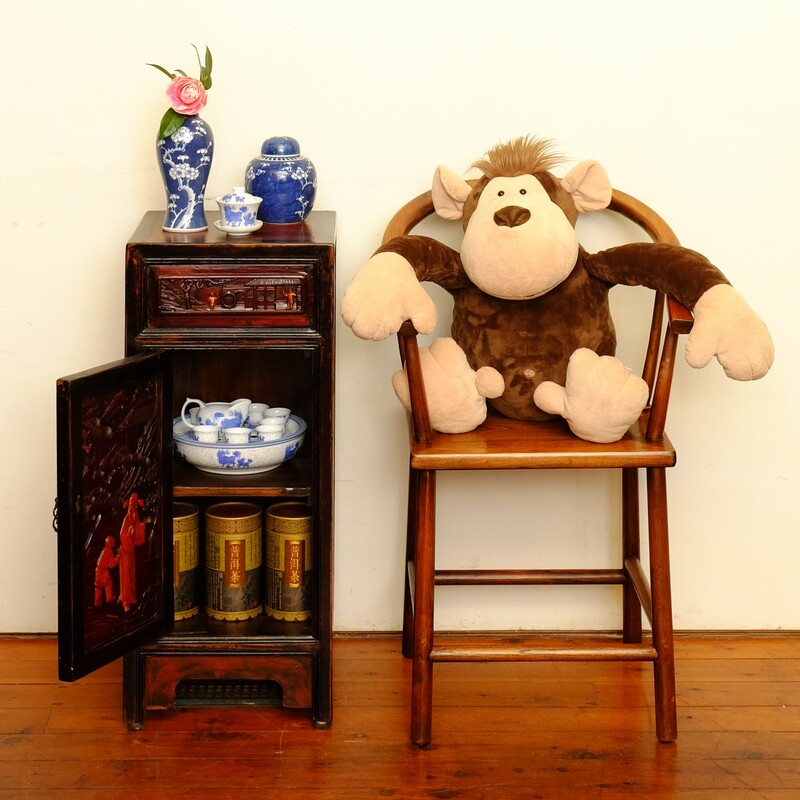 #15047 This two-door two-drawer cupboard was made from Chinese poplar in the late 1800s in Ningxia province. It is 90 cm wide, 38 cm deep and 88 cm high. 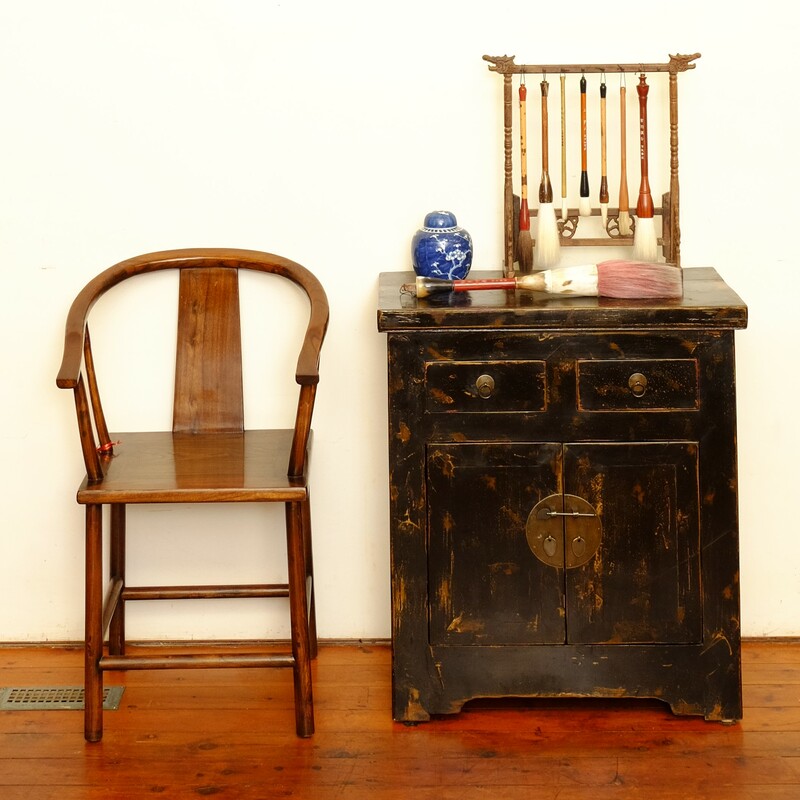 #15014, a painted two-door cabinet in willow wood, was madein the late 1800s in Ningxia province. It is 88 cm wide, 43 cm deep and 88 cm high. #111029a would make a useful and decorative bedside cabinet. 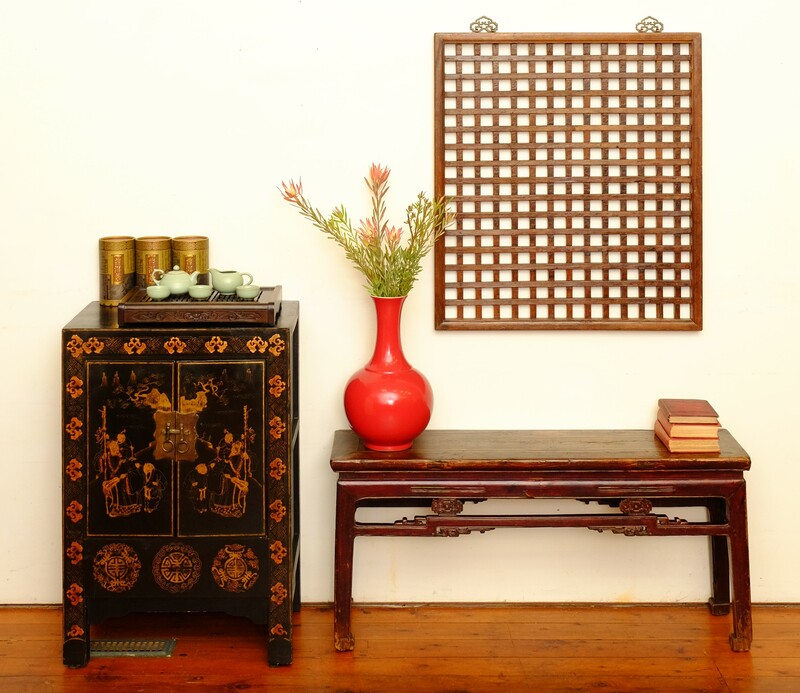 It is made from recycled elm and carved sections from a late 1800s screen from Hunan province. Since the screen was meant to be viewed from both sides the door also has a different scene carved on the inside and the outside. It is 36 cm wide, 36 cm deep and 82 cm high. #111029a view of the interior showing the carving on the inside of the door. 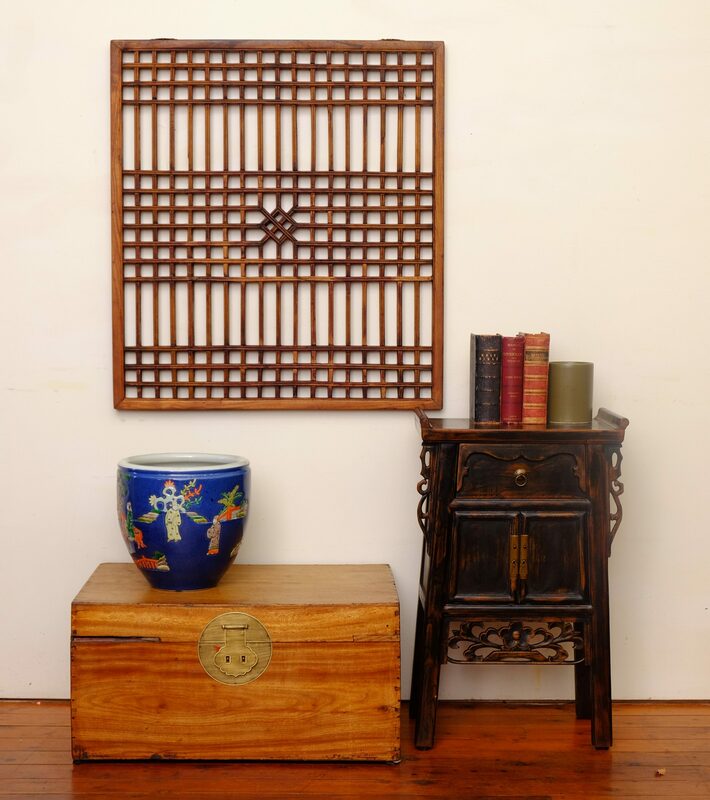 $16039 is an attractive cream lacquer cabinet with hardstone inlay that was purchased in Hong Kong in the 1960s. It is 56 cm wide, 27 cm deep and 78 cm high. 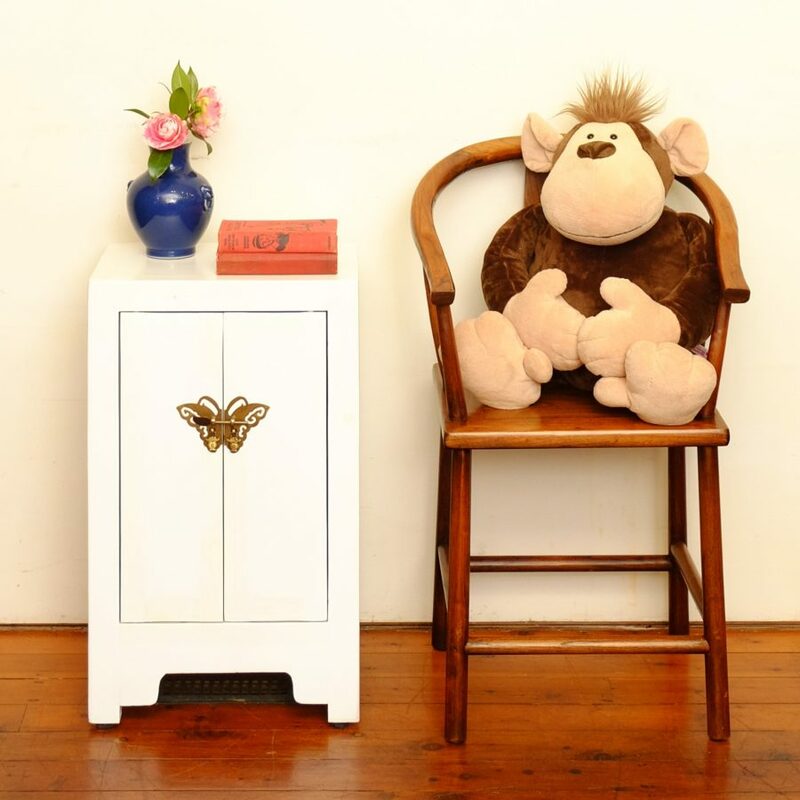 #13587 is a white lacquered recycled elm bedside cabinet. It is 43 cm wide, 32 cm deep and 60 cm high. #13587a is a white painted bedside cabinet with one drawer and two doors. It is made from recycled elm painted with gilt butterflies and measures 40 cm wide, 32 cm deep and 61 cm high. 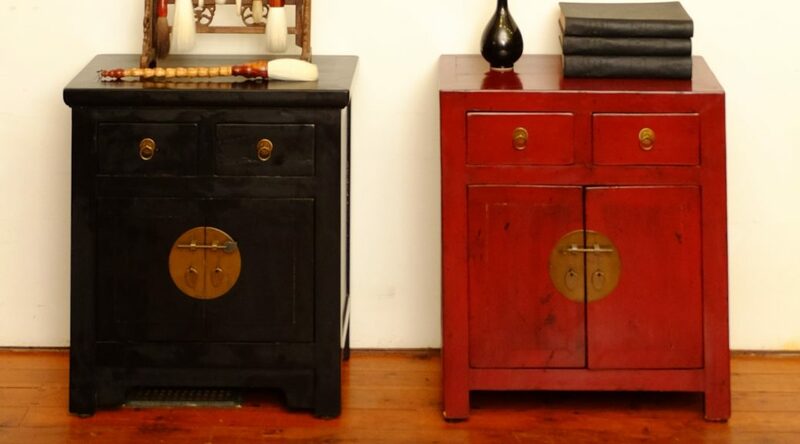 #13587a is one of a pair of red painted two door bedside cabinets. They are made from recycled elm decorated with a gilt mountain scene and measure 43 cm wide, 32 cm deep and 69 cm high. #16030 is one of a pair of 2-door black painted cabinets with a gold border and painted scenes on the doors. They are 58 cm wide, 38 cm deep and 86 cm high. 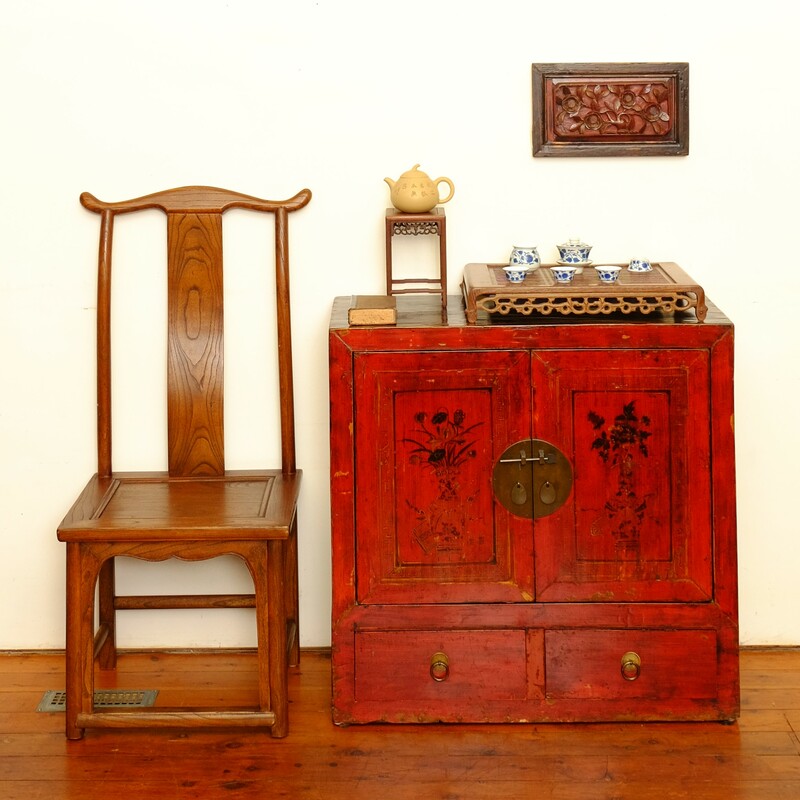 #15013, a low black two-door cupboard made from fir wood in the late 1800s in Fujian province. 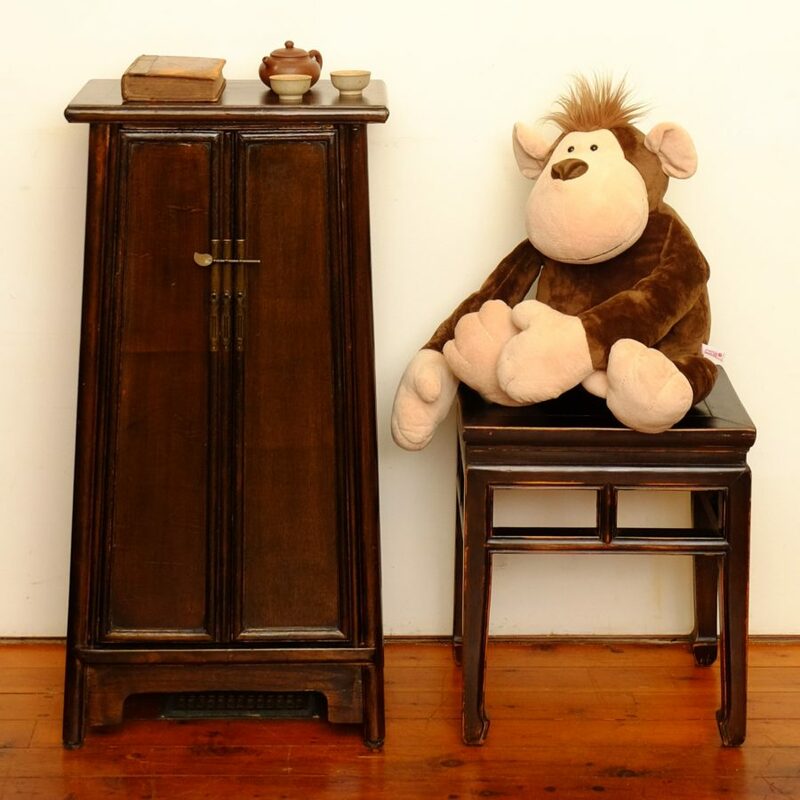 It is 81 cm wide, 37 cm deep and 52 cm high and has one internal shelf. 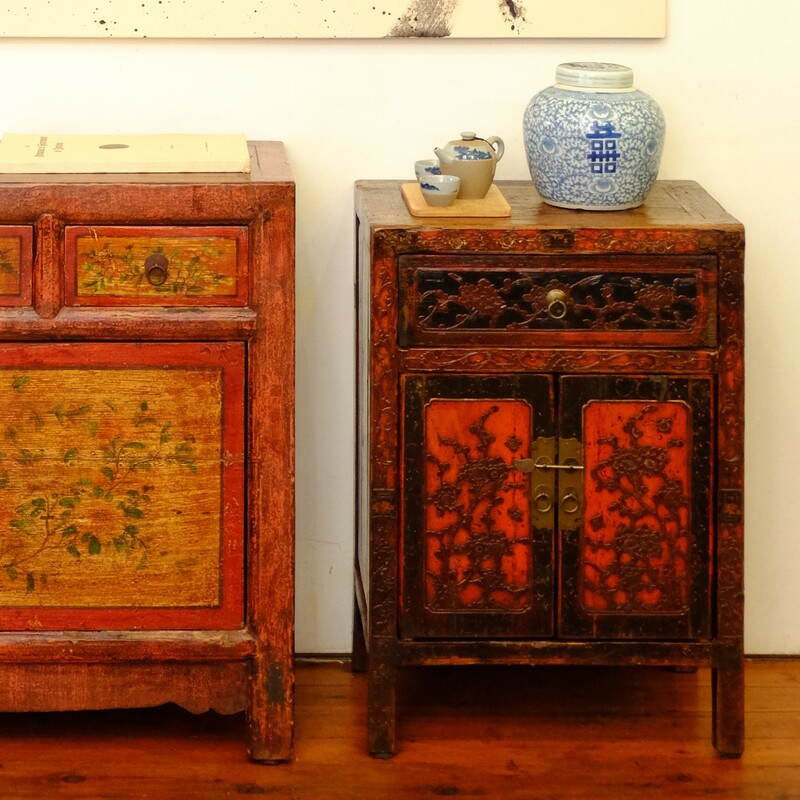 #15068 are refurbished two-drawer cabinets in northern elm from Shanxi province. 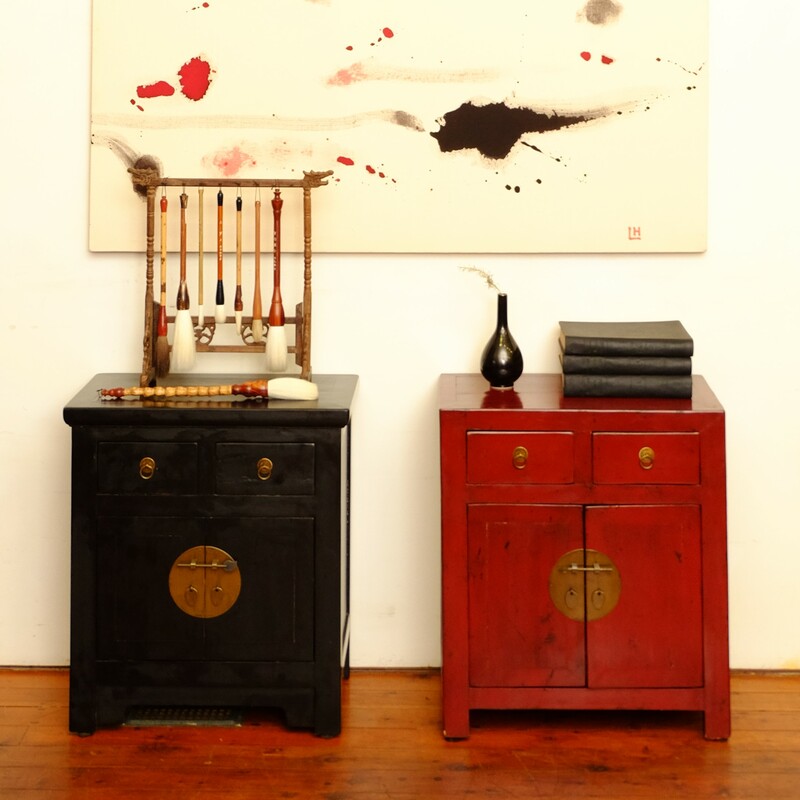 In red or black lacquer or a natural timber finish, they measure 60 cm wide, 38 cm deep and 68 cm high. 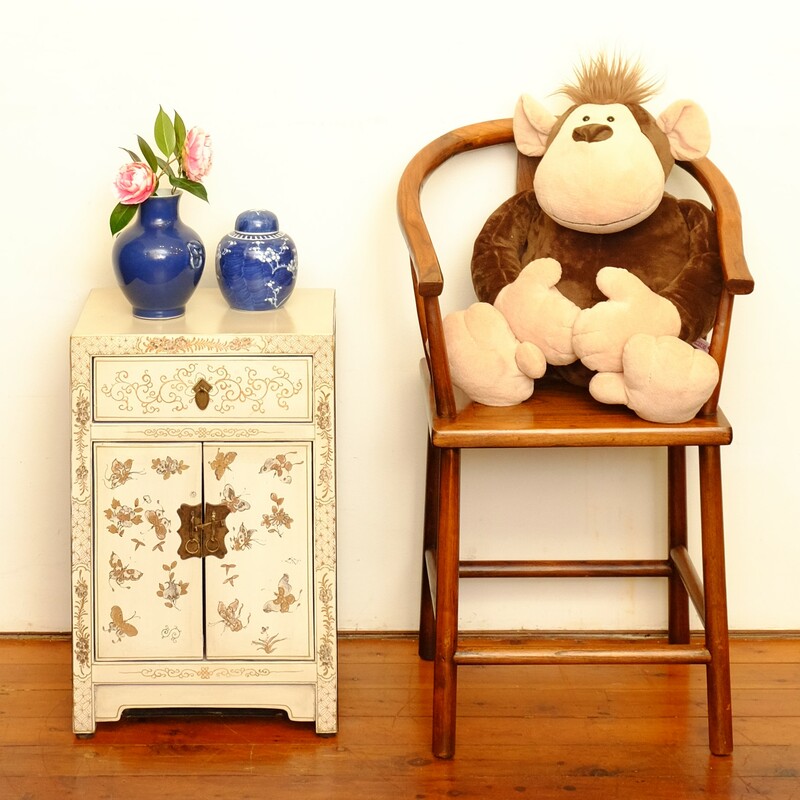 They make handsome and very practical bedside cabinets. 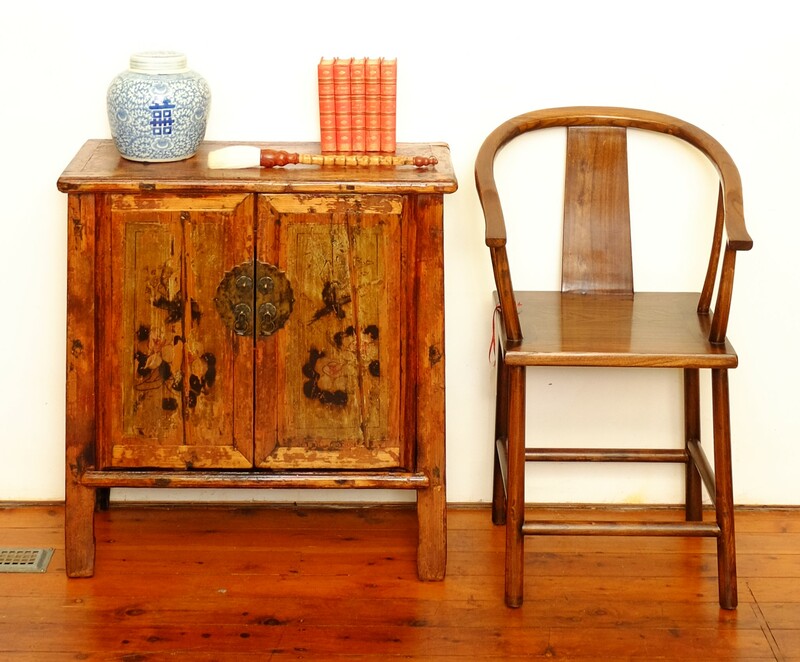 #15004 is a two-drawer cabinet made of northern elm in the early 1900s in Shanxi province. It is 85 cm wide, 39 cm deep and 90 cm high. 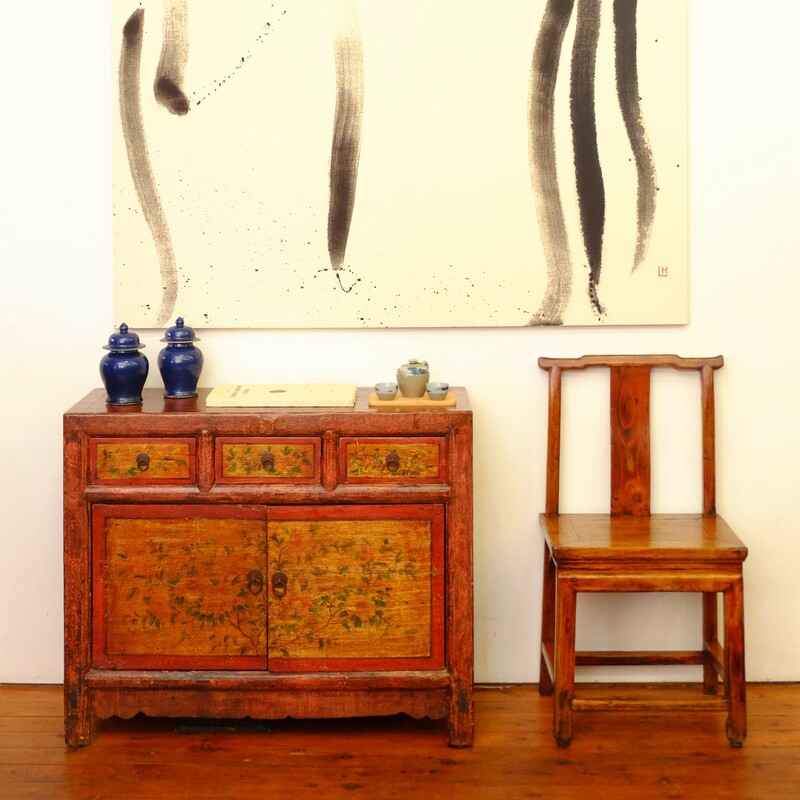 #15046 is a two-door two-drawer painted cabinet that was made in the late 1800s from Chinese poplar in Ningxia province. It is 88 cm wide, 38 cm deep and 86 cm high. #120019 is one of a pair and would make a handy bedside cabinet. 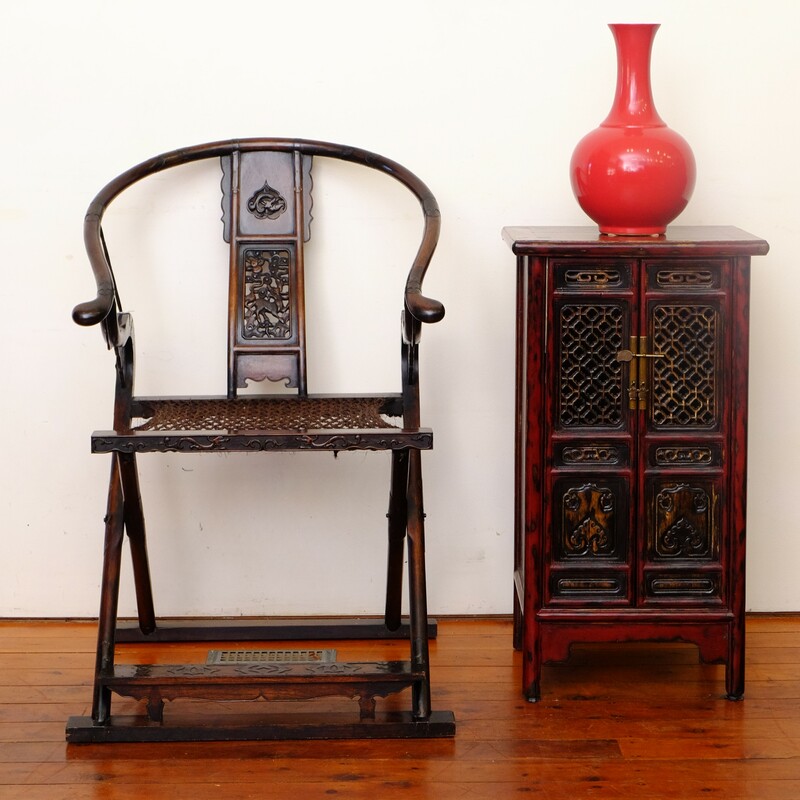 It was made in Shanxi province in the early 1900s from northern elm and is 73 cm wide, 40 cm deep and 82 cm high. 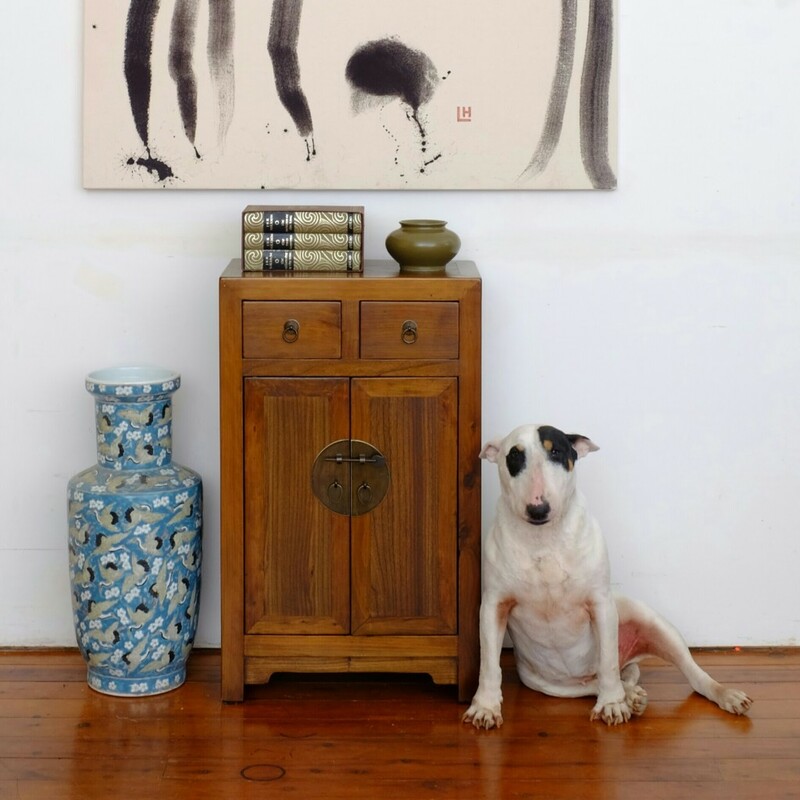 #15008 is a two-door painted cabinet made from fir wood in Fujian province in the early 1900s. It is 77 cm wide, 38 cm deep and 77 cm high. 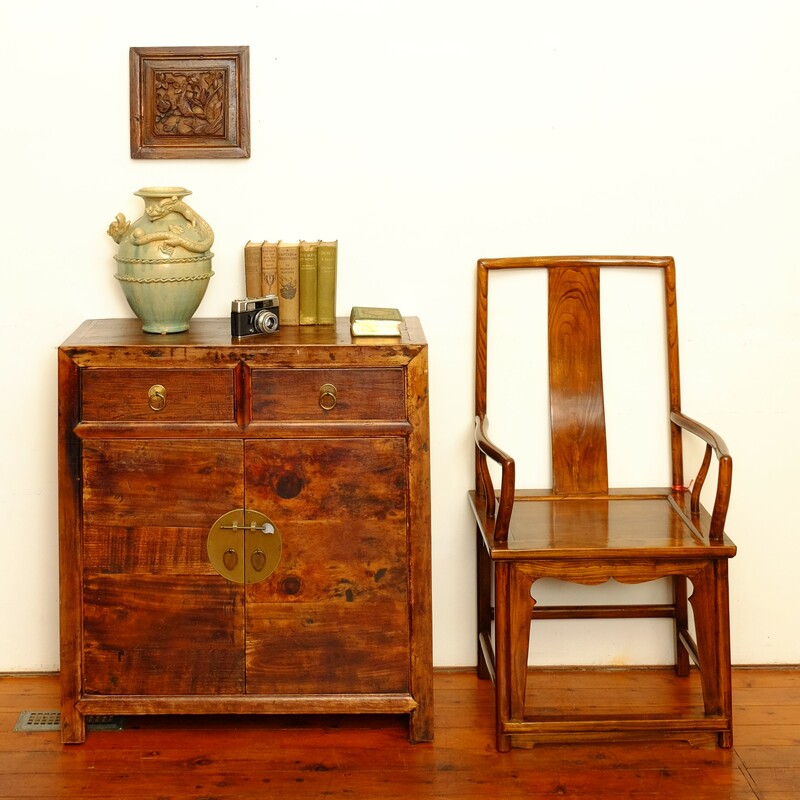 #112015is a two-door small elm cabinet dating from the late 1800s in Shanxi province. It is 77 cm wide, 36 cm deep and 79 cm high. 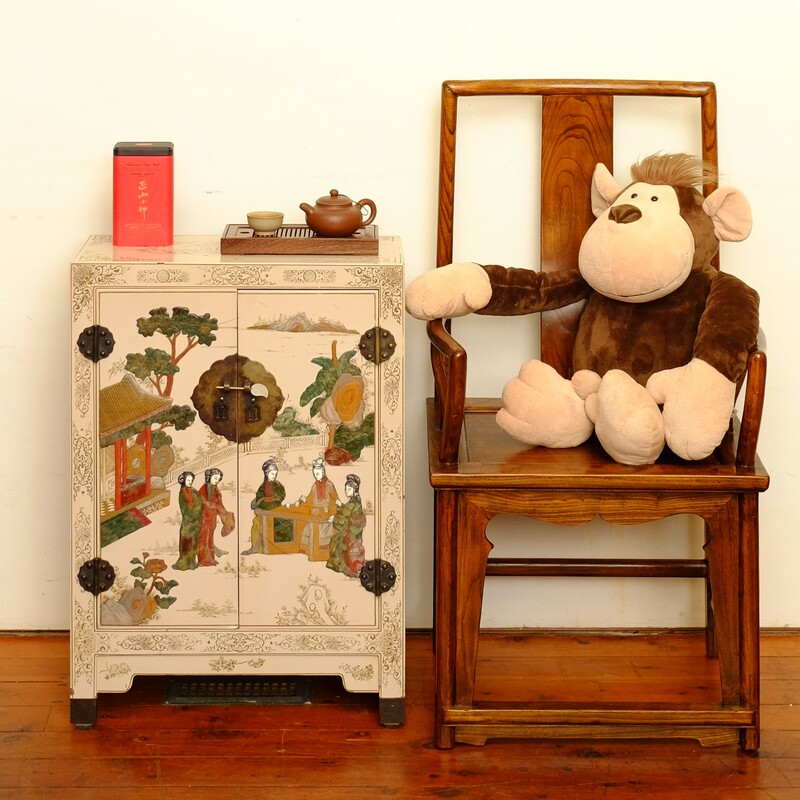 #15016 This small gilt painted cupboard in fir wood dates from the late 1800s and comes from Fujian province. It is 55 cm wide, 40 cm deep and 78 cm high. 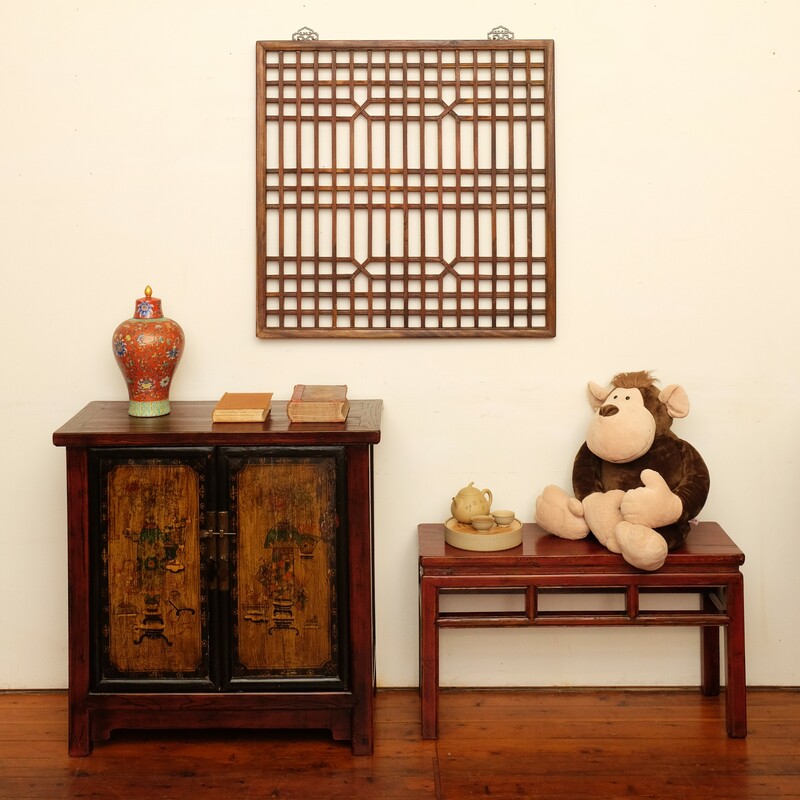 #15083 is a two-door cabinet hand made from 100-year-old poplar screens from Fujian province and recycled northern elm. It is 48 cm wide, 37 cm deep and 87 cm high. 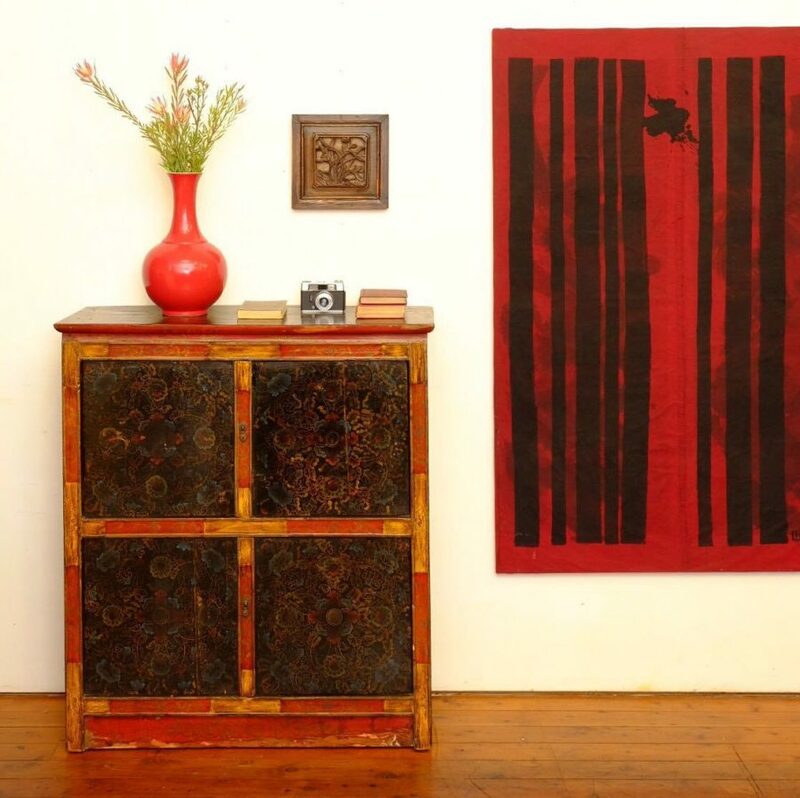 #15031 is a carved panel A-frame cabinet or bedside cabinet dating from the 1930s. Made from northern elm, it is 52 cm wide, 32 cm deep and 83 cm high. 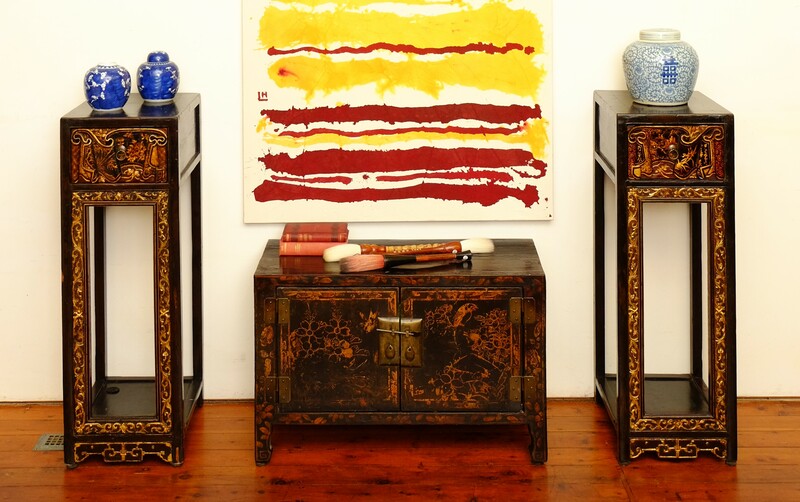 #15085 is an elegant Ming-style two-door cabinet/bedside cabinet hand made from recycled elm. It is 49 cm wide, 32 cm deep and 98 cm high. 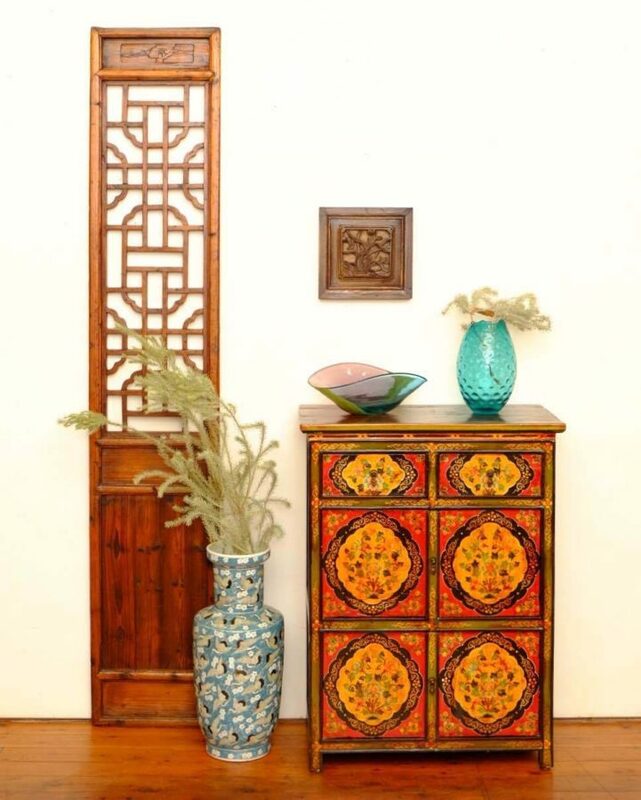 #15003 is a Tibetan painted two-drawer four-door willow cupboard that is guaranteed to brighten any room. 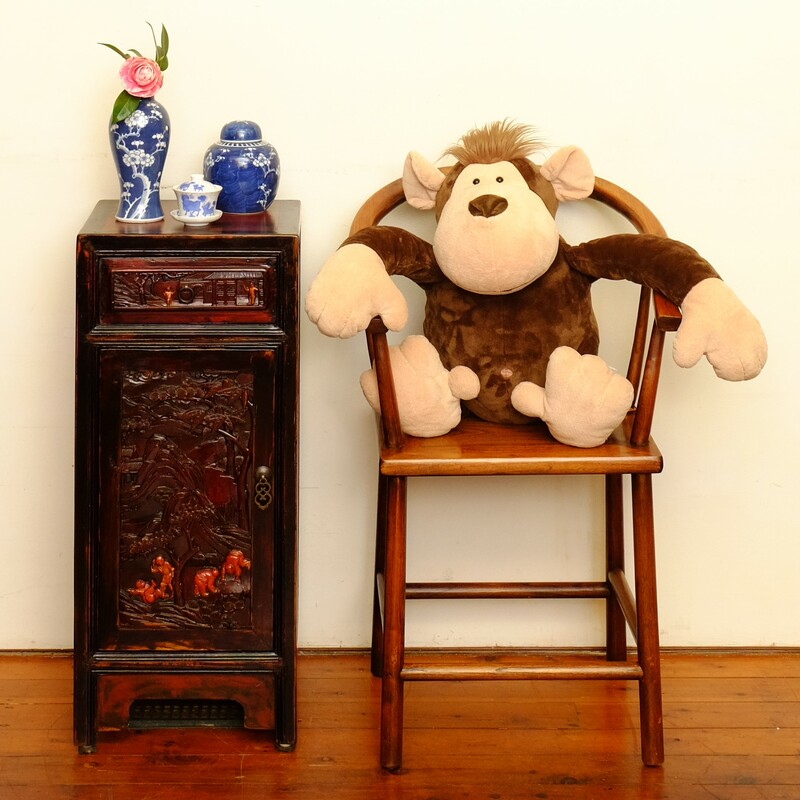 It was made in the early 1900s in the Tibetan region and is 75 cm wide, 40 cm deep and 100 cm high. 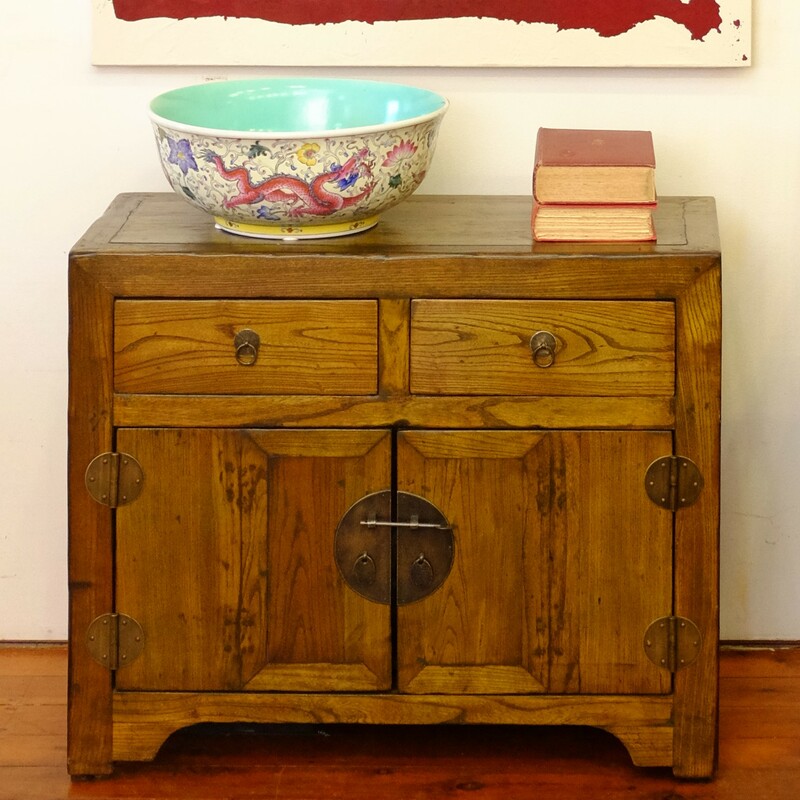 #17002 is an antique Tibetan cabinet painted in unusual blue tones. 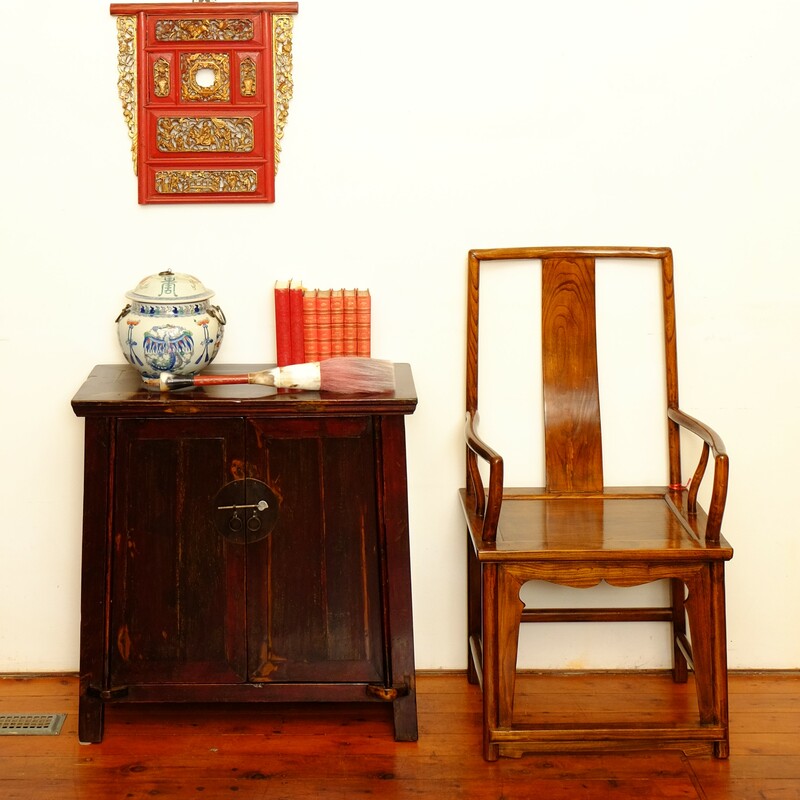 Of solid construction, it has four doors and measures 103 cm wide, 41 cm deep and 101 cm high.